Eee 701 Planetoid | Being the continuing adventures of T.A. Walker and his Asus Eee 701SD "netbook" (plus a Raspberry Pi). I wondered if there was a not-too-complex way to set up a similar feature on a Linux machine, preferably at the X11 level (i.e. not tied into a particular window manager or desktop environment), and a quick Google search revealed I was in luck. In short, there’s an X.org-based command-line utility called xcalib, which is mainly intended for monitor calibration, but which has a handy feature: yes, it can invert the current X display’s colours (effectively, giving you a negative of the display). The program isn’t included in Arch Linux’s main package repositories, so you’ll have to build/install xcalib from the AUR—it’s a tiny program, so that will barely take you longer than installing it from a repo would. (for “invert” and “action”—i.e. “do it”) will invert your display’s colours; running the same again will switch it back. Maybe this feature is already present in some DEs, but at least this one will work in any X.org environment—hope it helps you too! Thanks to botched “manual intervention” on my part, whilst trying to accommodate Arch Linux’s recent consolidation of all binary executables in /usr/bin, I ended up with an unbootable OS on the Eee (and the Raspberry Pi too, though that’s another, less pressing, issue). Despite Googling around and trying all sorts of fixes, I simply don’t have the time or the inclination to hack the system back to working order. Given that the system has a number of long-standing issues (again, which I’ve never quite got around to trying to resolve), and the Eee’s solid-state drive is permanently over 95% full, I have taken the decision to “wipe the slate clean”. I’ve made a backup of my home directory and any other important files I could think of, and I am going to wipe the Eee’s drive and do a complete, “ground-up” reinstallation of Arch. This time around, I want to avoid installing any GNOME-related material wherever possible, and am planning to go for XFCE and Fluxbox as my desktop environment and lightweight window manager respectively (so I can choose between them). I’ll be setting up Chromium, Dropbox and various other applications I make regular use of, and I’ll try and drop by here from time to time and let you know how it’s getting on. I know that a total reinstallation sounds drastic, but I’ve had it on my mind for the Eee for some time. I still think Arch is the Linux distribution most suited to the 701—though I can’t pretend I’m entirely happy about the way the distro handles major “under-the-bonnet” system changes (and the /usr/bin one isn’t the first to cause me problems), in my view Arch’s customisability (especially for limited hardware) gives it a serious advantage over the Linux competition, at least for me. It might surprise readers to learn that I’ve had surprising difficulty finding a “lightweight” graphical Twitter client for Linux, that works comfortably on a small screen and (for good measure) has a multi-column display mode. It’s a Python program, so if you don’t already have the dependencies installed (and there are quite a few, mostly python2 and related packages), pacman will need to retrieve them. Once it’s installed, Turpial will ask you to enter your account details and authenticate with Twitter; the latter will ask you to enter a number into Turpial itself, to ensure the app has permission to interact with your Twitter account. Your profile, favourites and a search column. 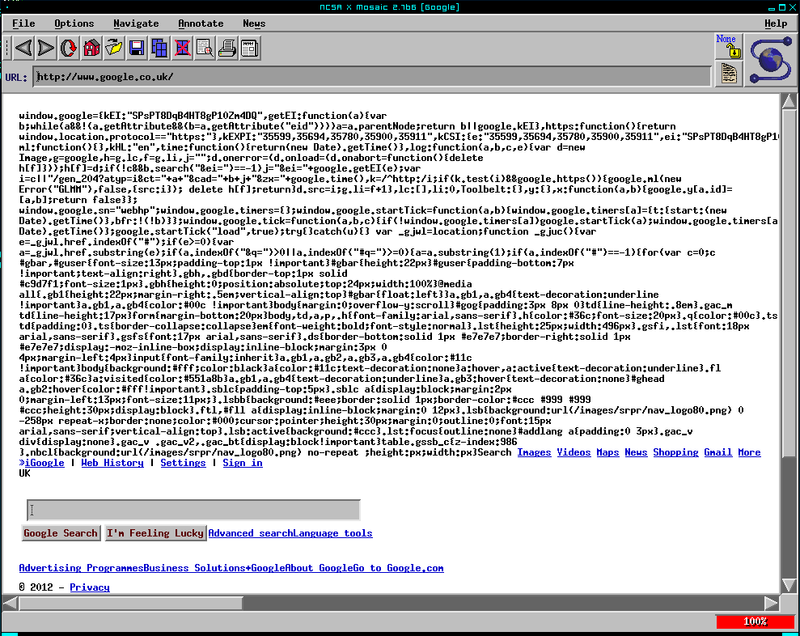 If you have a notification daemon running, Turpial will let you know when new tweets are received. I use the XFCE notifier on my Eee and RasPi, with no problems experienced. A row of pictogram buttons below the message columns, takes the place of a text-menu, giving you access to the application’s other options, including posting a tweet, finding and following other users, posting an image (but not other multimedia) and the program’s preferences. The “update status” dialogue box has a handy “add friend” option, to choose friend(s) from a list box to include in a tweet. There is also a separate field for shortening URLs (you set the shortening service of your choice in the preferences). Both handy features, and not always implemented in more “modest” Twitter clients—thumbs-up to the Turpial team here. Similarly, the “filter” option allows you to specify words which you would rather not see in your timeline. I haven’t tried this yet, so I don’t know whether it “bleeps out” words or hides entire tweets containing them, but it could be handy if you want to hide a certain hashtag! Overall, with Turpial, I feel I have found the Twitter client I have been watching for all this time, and not only for my Eee 701: it works usably well on my Raspberry Pi too. Being a Python program, Turpial doesn’t require separate compilation for the Pi’s ARM processor, so new versions generally arrive around the same time in the Arch repositories for ARM and x86. Turpial takes around thirty seconds to load on the Pi, but once it’s running, I find you can leave it up without great impact on the system. Want an uncluttered, native, graphical Twitter client with a multi-column interface, which will run comfortably on a modestly-specced machine? Tall order, but I think Turpial meets these requirements, and is well worth a look. Raspberry Pi Model B, a set on Flickr. I took delivery of a PiHouse case for my Raspberry Pi Model B over the weekend, and when I’d assembled and installed everything (I’ll try and put together a review shortly), I took a few photos and put together a Flickr photoset of “ryo-ohki” (my Pi), to show off the new case. I have to wonder, how the various connectors on the board (USB, Ethernet, HDMI, etc.) will stand up to being plugged into and unplugged over time. The micro-USB power-supply socket in particular, is pretty stiff, and requires a moderate amount of force to connect and disconnect. As this latter is quite small, I am mildly concerned that it may break one day, especially as I am unlikely to be able to repair the connector myself. Time will probably tell. Oh yes: power supply. Hold that thought. The Raspberry Pi has a number of operating systems which it can boot and run from SD memory card—mostly ARM-based Linux distributions, but also some more exotic platforms such as RISC OS. I chose Arch Linux ARM, largely due to the experience I’ve gained from running Arch on my Eee. Aside from an initial refusal to boot—rectified by simply re-writing the OS to the SD card—I didn’t encounter any problems booting Arch/ARM on the RasPi. It started essential services without a blip, joining our home LAN (via Ethernet) and setting the clock from the Internet via NTP, all without manual intervention. I was even able to carry out a full package update (# pacman -Syu), which the Pi executed without a grumble. Pretty impressive for an ARM-based computer the size of a bank card. Remember I mentioned the power supply earlier? If there’s one “fly on the Pi” to date, it’s a biggie: the machine is incredibly fussy about the power it receives over USB. If the current drops much below 1A, the Pi begins to behave erratically, or at worst will stop functioning altogether. Sadly, I’ve experienced one of the most common “low-power” issues: keypresses from the keyboard are repeated or missed out, making it well-nigh impossible to enter commands. I’ve tried both USB wireless and wired keyboards—the former does at least work (after a fashion, albeit exhibiting the repeat-keypresses problem), whilst the latter causes the OS to “kernel-panic”. Finally, I bought a Nokia AC-10X micro-USB power supply (higher output than most), and tried the Logitech K360 USB wireless keyboard we used (infrequently) for our Wii. One or both of these fixed the keypresses issue, so I was able to go onto more fun Pi-pursuits! Apologies for the total lack of updates for a while here—I’ve been kept busy with the infamous “other things” (aren’t we all? ), but also… well, to be honest, I’m pretty much “ticking over” with the Eee. I’ve got the system more or less the way I want it, and I doubt there’s going to be much to report on the Eee front for a while (unless I feel like telling you how I managed to sort out the current package-update failures, and that depends on whether I do sort them out!). Back in January, I posted here about the Raspberry Pi, a $35 ARM-based computer on a board the size of a credit card, aimed at helping schoolchildren in the UK to start learning how to program. Obviously, techies around the world got enthused, and immense interest in the Raspberry Pi meant that even two months after its launch, to date only a few fortunate computing fans have managed to order and take delivery of the first run of “RasPi’s”. Well, you will shortly be able to count yours truly amongst their number, as I have just placed my order for one of these little beauties 🙂 I understand it should be despatched within the next few days, and hopefully that means I should take delivery of my Raspberry Pi some time next week. I’m planning to run the ARM version of Arch Linux on the RasPi when it arrives (though I may settle for Debian/ARM if Arch/ARM is too lacking in features—watch this space), so I hope I can transfer at least some of what I’ve learned with Arch/x86 on the Eee, to the Pi. What I don’t know yet, is what all this will mean for this blog. My first choice would be to rename it, to accommodate coverage of my experiences with the RasPi as well as the Eee—however, I need to look at what a change of blog title would mean for the URL, and ensure that links to the blog are not severed. If I can’t change the name without these issues, I may have to set up a “sister” blog for the Pi, though I’d rather not do this if I can help it, as I’d like to keep the Eee and Pi material together as far as possible. For some time, I’ve been looking for a non-fiddly (and preferably GUI) way of switching display modes on my Eee, especially if an external VGA monitor is connected. The basic tool for controlling displays, xrandr, is powerful and flexible, but also quite difficult to use if one is not gifted with a particularly good memory for complicated command-line strings (especially if more than one display is involved). There are a number of graphical front-ends for xrandr, but I found all the ones that I tried, were either clunky, buggy, partially or entirely ineffective, or a combination of these. 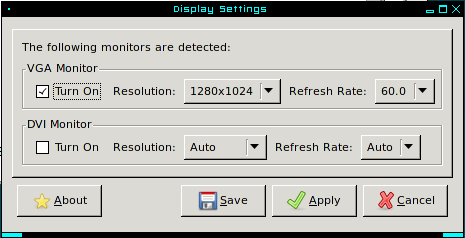 However, the other day (and I can’t remember where), I read a suggestion that Linux users not employing a DE, could try lxrandr, the display settings GUI used in the LXDE desktop environment. Installing lxrandr isn’t difficult, as it can be found in the main Arch repositories—a simple sudo pacman -S lxrandr should be sufficient. As you can see from the screenshot, the program makes it very easy to activate, deactivate and configure displays; I have used it to control the output from my Eee to a VGA monitor, and as long as xrandr can detect display modes and the like, then I imagine lxrandr should be able to do so too. In short: if you’re after a simple but effective GUI for a Linux system without a DE, then you could do far worse than try out lxrandr. The default Web browser I use on the Eee is Chromium (basically, the open-sourced relative of Google Chrome without the Google branding and other “hooks”). In most respects, the Chromium in the Arch Linux repositories is more or less identical to Chrome in functionality, but one missing feature—which you may or may not miss—is Chrome’s built-in PDF-viewing functionality. If you do miss it, the Arch wiki reveals a few options for PDF-enabling Chromium; my preferred option, which I’ve used on the Eee, is to install chromium-stable-libpdf from the AUR. This seems to work without a blip, and Chromium auto-updates from then onwards without losing the PDF feature, so it’s worth a try if you want this (and/or are looking for an alternative to Adobe Reader, Evince, xpdf and their ilk…). And here is a screenshot to prove it: NCSA Mosaic running on my Eee under Arch Linux (the screenshot was taken from a 1280×1024 external display, in case you wondered why it looks larger than 800×480)! If you’ve read the last post I wrote on this blog, you will be aware that I am eagerly awaiting the launch of the Raspberry Pi (an ultra-low-cost computer on a circuit board the size of a credit card, running on an ARM processor). To cut a long story short, I’m already thinking of software I could run under Linux on the machine, and the Fluxbox window manager (which I use on my Eee 701) is one possibility I have been considering. With the above in mind, I thought I would try creating a Fluxbox “style” (theme) based on the Raspberry Pi logo and its colours. Not only would the theme aim to reflect this identity, but I wanted a Fluxbox style which would be clear, minimalist and uncluttered, and be usable and readable at a wide selection of screen resolutions (up to and including full HD (1920×1280), which the “RasPi” is apparently more than capable of). 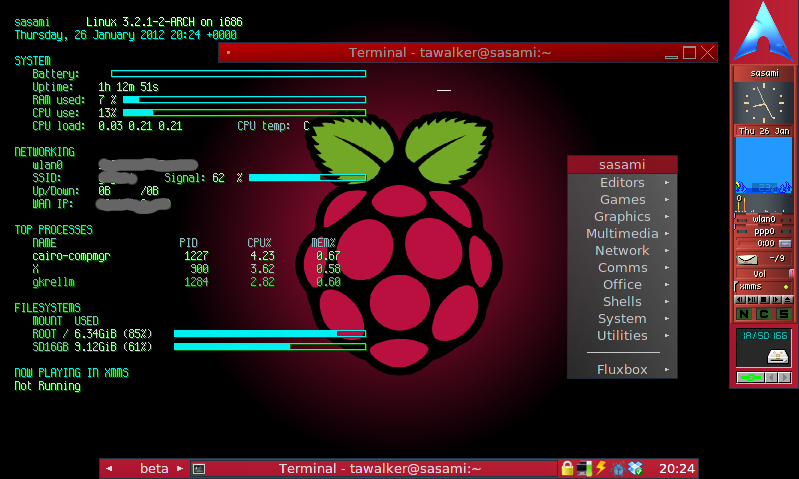 This month’s “My Eee Desktop” shows where I have reached with the Raspberry Pi style. I created the wallpaper image in Inkscape—the RasPi logo has been made available as an SVG vector image, so I took this and placed it over a gradient-filled circle (to give the “halo” effect) on a black background. The wallpaper image is set at 800×480 resolution (that of the Eee 701), but if a higher resolution is used, the image is centred on the screen and the background around it is also black, so the style is very adaptable. As I would envisage connecting a RasPi to an HD TV, I chose black as the most suitable background colour for looking at over a lengthy period (just in case!). The menu and window fonts are set a little larger than normal for my Fluxbox styles, to make them more readable at high resolutions, whilst still not taking up too much space on an 800×480 display. The only other point to note (particularly for longer-term readers here), is the addition of a GKrellM plugin to add an analogue clock. This takes up slightly less vertical space than a WindowMaker dockapp (as do most of GKrellM’s “monitors”), which on a screen with only 480 vertical rows of pixels, makes plenty of difference! Raspberry Pi: a PC in your pocket? The product in question is the Raspberry Pi, and although it is officially aimed at schools and the education market, the device already has computing and Linux fans straining at the leash to get their paws on one. Judging by the coverage, the reasons are not hard to understand. In short, the Raspberry Pi is a functioning computer, with (on the “Model B”) an ARM processor, 256Mb RAM, a OpenGL-capable graphics system with HDMI and component video output, audio out, 10/100 Ethernet, USB and 5V micro-USB power… all built onto a circuit board the size of a credit card, and likely to cost around UKP25. Initially, the device will be sold “as is”, without a case or enclosure, though from what I have read, there is no shortage of enthusiasts stepping up to design custom cases, or suggest alternative enclosures (an empty tin of Altoid mints seems to be a popular one!). There are plenty of news sites picking up on the potential of a device like this. To pick one out at random, The Guardian has given the Pi some attention in its Education section, focusing on the avowed aim of the project to revitalise the teaching of computing in schools (and perhaps even inspire a new generation of coders and ‘hackers’ (in the non-criminal, inventive sense of the term)). OK… so why am I posting on my Eee blog about the “R-Pi”? One reason is that I’ve always been interested in small and inexpensive computers, from the Psion Series 3x and Series 5mx I owned in the late 90s, through to the Eee 701 itself, and the Raspberry Pi looks like it packs a lot of functionality into a very small and cheap package. Furthermore, as a leaf through this very blog should reveal, I am a keen Linux “tinkerer” when it comes to my Eee, and the R-Pi provides ample scope for experimentation, with HDMI, USB and Ethernet connectivity in a low-power device. There are a number of prominent Linux distributions which have been ported to the ARM processor family, including Debian and Fedora, but most of interest to me is Arch Linux ARM, as I could hopefully “port” my experience with Arch’s x86 sibling to the R-Pi. The word is that the Raspberry Pi will be made available to purchase from their Web site from the end of this month (January 2012), and I for one will be keeping an eye on this very closely. A blog dedicated to the continuing adventures of T.A. (Tim) Walker and his Asus Eee 701SD (the original "netbook"). Warning: some posts contain graphic scenes involving Linux command lines. What is an Eee 701?